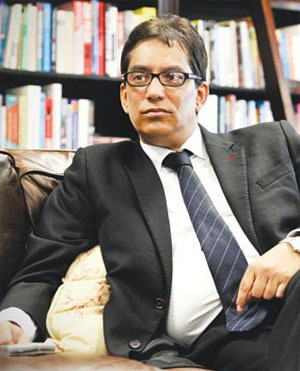 Prominent people had an interest in seeing the JSE listing of Sagarmatha Technologies - the umbrella company intended to unite Iqbal Survé's media empire under one roof - become a reality, the PIC inquiry heard on Monday. PIC portfolio manager, Sunil Varghese, said there were "ambassadors, Russian tycoons and influential families" who had their eye on the company, envisaged to become the continent’s tech giant. Varghese said there was pressure for Matjila to build a "dream e-commerce company in Africa". The intention had been to "create an e-commerce and media company on the JSE that would later list on the NASDAQ to attract tech-savvy investors", he said. Sagarmatha wanted to raise R3bn in its initial public offering which was expected to take place in April 2018. Its asking price was R39.62 per share. The PIC resolved that a price of R7.06 for share was the right value. Varghese testified that the PIC teams had evaluated the Sagarmatha business case, and during one of the meetings it was indicated that the valuation was too high. Although Sagarmatha was punted as a ground-breaking e-ecommerce giant, Varghese stated that interactions with representatives of the firm demonstrated that they "did not have the experience to execute the grand vision presented". In his testimony, Varghese referred to an email written by former PIC CEO Dan Matjila which pushed for the deal, saying: "Sagarmatha will provide us with a R1 strike call option …that gives us an average price of R8.50 per share price exercisable on the date of listing". The investment team responded that the price was "too high and the collateral not sufficient". Varghese said Matjila reluctantly agreed and promised to inform Sekunjalo. Last week, the inquiry heard that the business case for company had raised red flags from the start. In April 2018, the JSE cancelled Sagarmatha's listing, saying the company had not submitted its annual financial statements to the Companies and Intellectual Property Commission in time for the listing to go ahead. The inquiry will resume on Tuesday.